Professor Peter Holmes, Vice-Principal of Research at the University of Glasgow, UK and Professor Mike Turner, Division of Infection and Immunity, Faculty of Biomedical and Life Sciences and Wellcome Centre for Molecular Parasitology, University of Glasgow, UK, visited the BecA-ILRI Hub on Friday 20th February for information on BecA activities and to see the research and training facilities. The University of Glasgow is a research-led university that is recognised internationally for its groundbreaking work. Professor Peter Holmes (left) the Vice-Principal of Research at the University of Glasgow, UK; Professor Mike Turner (second on right) Division of Infection and Immunity, Faculty of Biomedical and Life Sciences and Wellcome Centre for Molecular Parasitology, University of Glasgow, UK; Dr Rob Skilton (second from left), a research scientist with the Hub. 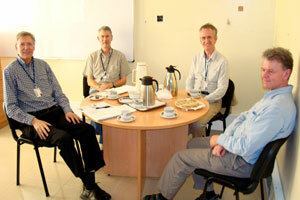 Dr Harry Noyes (right), a visiting scientist at ILRI from the University of Liverpool, UK. The University of Glasgow Centre for International Development builds on the University's historical tradition of engagement with low-income countries through its unique range of expertise in the areas of human well being and animal health, the economy, the environment, learning and citizenship.